Today I decided to do a quick experiment. I’m on board the business class on a train bound for Göteborg. And as usual I have my trusted Huawei MiFi to give me internet access. With the recent fuzz around Firesheep I decided to do a quick test. 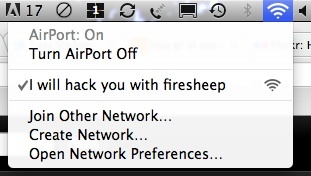 I renamed the SSID on my MiFi to “Free WiFi” and turned off the encryption. Launched Firesheep and waited. After less than fifteen minutes I had a Facebook account that I could log on to. On the status page from the MiFi I could see that I had three computers connected. But.. in fact, people were also able to log on to your account, weren’t they? Unless you had the patchfix, of course. A bit off-topic, but which MiFi box do you use? I need one. Actually you were correct – your WLAN name beats all the names at the holytaco.com link. Woo that’s so interesting, how the people can long on so quickly in some wiffi signal if they don’t know who can see it, well the word FREE is tempting for everyone! I’m Sorry if my English is not the best, because I’m still a young student.